Wing-Commander Sir Lawrence James Wackett was born in 1896 in Townsville, Queensland. As a boy he developed an interest in the natural environment, and in hunting and fishing. 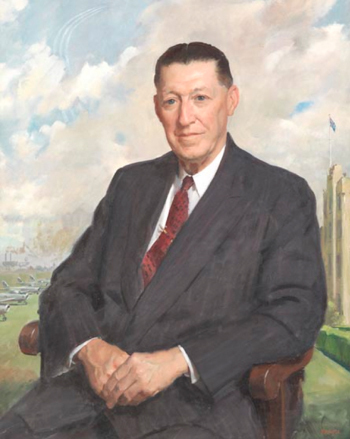 Wackett was educated at Duntroon Military Academy and went on to careers as pilot, inventor, designer of airframes and engines, entrepreneur, manager and author. In the 1914–1918 war Wackett served overseas as a member of the newly formed Australian Flying Corps. After the war he was one of a select group of officers brought together to form the nucleus of the new Royal Australian Air Force. Two years later Wackett moved into aircraft design, including the Widgeon flying boats and the Warraguls, a fighter plane (the Wirraway) and the Wackett trainer. In 1954 Wackett was knighted for services to aviation. In 1946 he produced My Hobby is Trout Fishing. This little book’s eight chapters unequivocally comprise a technical manual but it is a manual in which the lessons are presented in story. Wackett’s first book is now one of Australia’s most sought-after angling titles. A third book, Aircraft Pioneer: An autobiography came out in 1972. Always an angler, Wackett included some fishing content in the chapter ‘Matters Personal’. Wackett also wrote an occasional magazine article, including ‘The fighting rainbows of Geehi,’ published in The Australian Shooters and Anglers News in May 1949. Wackett was left an incomplete quadriplegic in a fall at home in 1970. His methodical nature and inventiveness were undiminished and, very typically, he set himself the task of resolving the issues and difficulties caused by such injuries. Wackett died in 1982 in Sydney.